I’ve seen this ad for 2 weeks now glued on numerous lampposts along Bedford Avenue, on my way to-from Bed-Stuy YMCA. 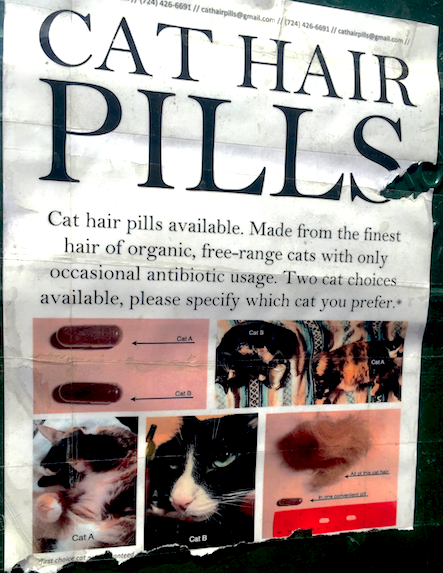 What do you do with cat hair pills? For humans or for animals? A traditional cure or a new homeopathic invention? No answer would surprise me. After having immersed in the study of yoga some 15 years ago I tried a lot of things. Nothing was wrong with me as such. But as I discovered, and was constantly reminded of, with yoga, the mind, spirit and body are in constant dialogue and they all should be taken care of, their health maintained. Everywhere I went in those circles, the message was that the best way would be a “natural” one. So I went for Ayurveda, many forms of energy healing (I’m a Reiki Master), all kinds of mediations and natural medicines, diets and fasts, massages and visualizations. A part of most of these practices was to study oneself. To immerse in self-reflection. To peel the layers of the onion. That way, one would re-discover more of the true self, and true nature of the holiness of life. So to enhance the process, I read ancient texts and new age guide books to a healthier, happier existence. Result? Many insights and happy moments. Quite a bit of money spent. And then, 2 years ago, I threw my back out. It was the single most scariest health-related experience in my life so far. I went to bed feeling some stiffness in my lower back. I woke up next morning and within minutes I couldn’t get up anymore. I spent over a week on the living room floor, crawling to the bathroom (no details about that). When I could finally walk again every step was a tentative one, coupled with an irrational sense that my back would break any minute. Duh, one might say. I’ve since learned that my experience is very common. But what followed was interesting. I tried a chiropractor who scared me by telling me about someone like me, on the verge of paralysis. I tried osteopaths for $200 per hour. I tried acupuncture that hurt like hell. I tried Chinese medicine and energy healing, and still couldn’t sleep on my back. I read about the revolutionary research that indicates that back pain is indeed stress-induced and can be mentally managed. And yet I kept feeling a stabbing pain close to my sacrum. Many different yoga teachers gave me many different authoritarian explanations, mostly psycho-spiritual, and as many instructions as to what to do. I developed a painful sciatica that travelled from one leg to another. Any forward-bend would set it off. Any backbend would set it off. Most poses in any yoga class, really. The cure? When I started to go to sports massage and to spinning classes. I was so desperate to do something, anything, and figured out that indoor biking wouldn’t require much of bending of any kind. Already after the first class I felt refreshed and renewed and pain-free. Now all the pain is gone, and when it reappears, I just do another spin class. So back to cat hair pills. I’m not the only one wondering. As with the pills, we may never know whether a claimed cure is about an art performance or someone’s real experience. It’s great to get tips and free samples to guide us in life and health. But the decision and responsibility is mine and yours. I have no idea… It’s a mystery. I think it’s an art project and we’ll find out soon enough. how much are they after a free sample?